India is a country that has never been known as a great sporting nation. Except for a few selected sports like Cricket and Hockey, our country has not produced many international stars. Our medals tally at the Olympics has been uniformly dismal. As far as women are concerned, most Indian families frown on their daughters if they show any inclination to take up sports as a career. Yesterday, I presented the story of Dhyan Chand, The Wizard of Hockey. Today I am going to present the story of Dipa Karmakar the young girl who revolutionised Gymnastics in India. Prior to Dipa, no Indian woman has ever participated in gymnastics in the international arena. Dipa Karmakar hails from Agartala in the North-Eastern state of Tripura. She was born on 9 August 1993. She started her school life in Abhoynagar Nazrul Smriti Vidyalaya. She began practising gymnastics at the age of six. Her coaching team comprised of Soma Nandi and Bishweshwar Nandi. Her father was a weightlifting coach at the Sports Authority of India and he was the one who introduced Dipa to gymnastics. The effort at gymnastics did not come easily to Dipa. She had flat-feet which is a strict no-no for gymnasts. But with constant training, she managed to develop an arch in her foot. She first won the junior nationals held at Jaipalguri in the year 2008. She was part of the contingent for the Commonwealth Games held in New Delhi in 2010. In the 2011 National Games, Dipa won the floor, vault, balance beam and uneven bars. She participated in the 2014 Asian games and stood fourth behind Hong Un-jong, Oksana Chusuvitina and Phan Thi Ha Than. She secured a score of 14,200. It was in the year 2014 that Dipa Karmakar became a household name by winning the Bronze medal in the Common Wealth Games held at Glasgow, Scotland. This made her the first Indian female gymnast to win a medal in an international event in the history of gymnastics. This was followed by a Bronze in the Asian Gymnastics Championships and she stood fifth in the World Artistic Gymnastics Championships. Then came the Summer Olympics in 2016 held at Rio De Janeiro and Dipa Karmakar represented India. She thus became the first Indian female gymnast ever to compete in the Olympics and the 52nd gymnast if both men and women are taken into account. She secured an overall score of 15,066 and stood fourth in the event. She missed the Bronze by just a whisker. She fell short by a mere 0.15 points. Though she missed the Bronze, her performance was eye-catching and it included a move called the Produnova or the 'Vault of Death.' This made her India's pride overnight. Produnova is regarded as one of the most difficult vaults currently performed in women's gymnastics. Dipa Karmakar is one of the five gymnasts who has successfully landed the Produnova. In July 2018, Dipa became the first Indian gymnast to win a gold medal at a global event. She achieved this at the FIG Artistic Gymnastics World Challenge Cup held at Mersin, Turkey. 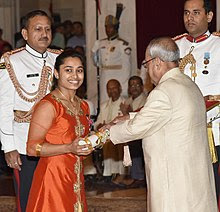 Dipa Karmakar was awarded the Padmashri, the fourth highest civilian honour in India. For her performance in the Rio Olympics in 2016, she was awarded the Rajiv Gandhi Khel Ratna in August 2016. Dipa's journey to the top has definitely not been a smooth one. Imagine a girl with flat-feet becoming a gymnast! It is unheard of. In 2017 she was plagued with injuries and had to drop out of a lot of competitions. But she stuck to it with guts and courage. Since 2017, Dipa is being supported by the GoSports foundation under the Rahul Dravid Athletes Mentorship Programme. Dipa has made it to the very top because of sheer dint of determination and courage and the fire to fight against all odds. She is an inspiration to all the women in our country which is by and large a patriarchal society where most parents do not allow girl children to single-mindedly pursue sports. She is a role model for the young girls of India who want to try out the unconventional and the near impossible. I hope you enjoyed reading about Dipa Karmakar, the girl from Tripura. Tomorrow I will come up with the story of yet another inspiring sportsperson. She is a youth icon and the first person to take Gymnastics to such heights in India. Thanks for visiting. Dipa's success is the biggest inspiration for girls throughout our country. Sheer hard work and loads of determination have taken her where she has managed to reach. I'm sure all of India would be praying for her and others in the 2020 Olympics. Yes, I am looking forward to her coming out on top in the 2020 olympics. Thanks for visiting. I thoroughly enjoyed reading about Deepa Karmakar's journey.Very Inspirational.Thanks for sharing. Thanks for visiting and glad you enjoyed the post. Deepa is my son's current obsession. We watch her performance videos almost daily. We are pinning our hopes on Deepa for 2020. She is a favourite in our family too. In fact entire India has pinned its hopes on Dipa for the 2020 Tokyo Olympics. Thanks for visiting. Thank you for writing about Dipa. I was secretly hoping you talk about her. I've followed her super inspiring journey and so glad that she's getting her due recognition now. We've reached the letter D and I suddenly realised I had not yet written about even one sportswoman and I decided it is time to change the trend. And who better than Dipa for the letter D? Thanks for visiting. Dipa Karmakar is a trail blazer. In a medal starved country, in a country with no history of gymnastics, she has won a medal in Olympics. What a feat. Thanks for visiting Abhijit. Small correction. She won a bronze in the Commonwealth Games. She stood fourth in the Olympics missing the Bronze by just 0.15 points. Such an inspiring journey. Loved reading it. Keep sharing more. Thanks for visiting Rashi. Yes Dipa's achievements are indeed unique. Yes, even I found out only when I was researching this article that she was flat-footed to begin with. A very determined young woman indeed. Thanks for visiting. My daughter literally adores Dipa. She keeps performing at home while watching her perform. Girls like Dipa have set an exaple for a lot of girls who want to become like them. Great post! Even my daughter thinks of her as a role model. Dipa has become a youth icon and revolutionized gymnastics in our country. Thanks for visiting. She is really an inspiration. I'm following her from the Olympics, she really had won many hearts by her performance. Absolutely, she is a great performer and some one to look up to. Thanks for visiting. Yes, she is someone who is a role model for a lot of young people and definiitely needs to be given her due. Thanks for visiting. She had to be in the list. She is one of my favorites too and I have been following her for sometime. So happy that you wrote about her. Yes. Absolutely, she had to be in the list. How could I have omitted her! :)) Keep visiting. Yes, she is our best bet for a medal in gymnastics in the Tokyo Olympics in 2020. Thanks for visiting. Nice to read about Dipa...I never knew of the difficulties she had to undergo before her success...thanks for sharing!